DESCRIPTION: This railway is distinctive for many reasons other than the extremely difficult terrain that the route traverses. In operation since 1900 and privately owned, it has never received any government subsidy. It pioneered containerized freight and, because of interests in shipping and trucking, become part of a total transportation system. The 110 mile (176 km) route is located in the United States and Canada: 20 miles (32km) in Alaska, 32 miles (51km) in British Columbia and 58 miles (93km) in Yukon. The rails between Whitehorse and Bennet Lake remain, although there is no longer a train service on them. BACKGROUND: The discovery of gold on August 17th, 1896, at Bonanza Creek in the Yukon, started the Klondike gold rush of 1897. Thousands took ships to Skagway, made their way up through either the Chilkoot or the White Passes to Lake Bennett and from there, by water, to Dawson – the centre of the goldfields. Early in 1898 two men met, by chance, in a Skagway bar. Michael J. Heney, a Canadian railway contractor, who was convinced he could build railway through the White Pass and Sir Thomas Tancred, an internationally recognised engineer, who represented English interests in financing a railway he, personally, thought it was impossible to build. He was accompanied by the American chief engineer of his group, Erastus Corning Hawkins and Canadian civil engineer John Hislop. Heney convinced Tancred that the railway could be built and that they should do it. This foursome saw it to its completion in 1900. Work started on the 3 ft. (0.9m) narrow gauge railway in April 1898 with the rails reaching Whitehorse in June 1900. About 35,000 men, mostly Canadian and American, built the line. The cost was, approximately, ten million dollars. From sea level, at Skagway, the line climbs 2900 ft. (884m) in 20 miles (32km) to the USA-Canada border at Summit Lake at an average grade of 2.6%. The maximum grade was 3.9% and the maximum curvature 16o. Most of the route was above the tree line in the midst of recorded snowfalls of 35 ft. (11m) and winter temperatures of -65oF. (-60oC). At Dead Horse Gulch a 215 ft. (66m) high steel cantilever bridge, the highest, most northerly of its type in the world, was constructed. The Second World War saw the operation of the line taken over by the US Army and used, primarily, to serve the construction of the Alaska Highway and the North-West Staging Route airfields. At this time a 4 in. (102mm) diameter oil pipeline was built parallel to the railway to serve the Yukon. Following the war, the development of silver, zinc and lead mines in Canada and a financial restructuring, led to the development of an integrated transportation system. An interesting outgrowth of this was the introduction of the world’s first containerized freight handling. 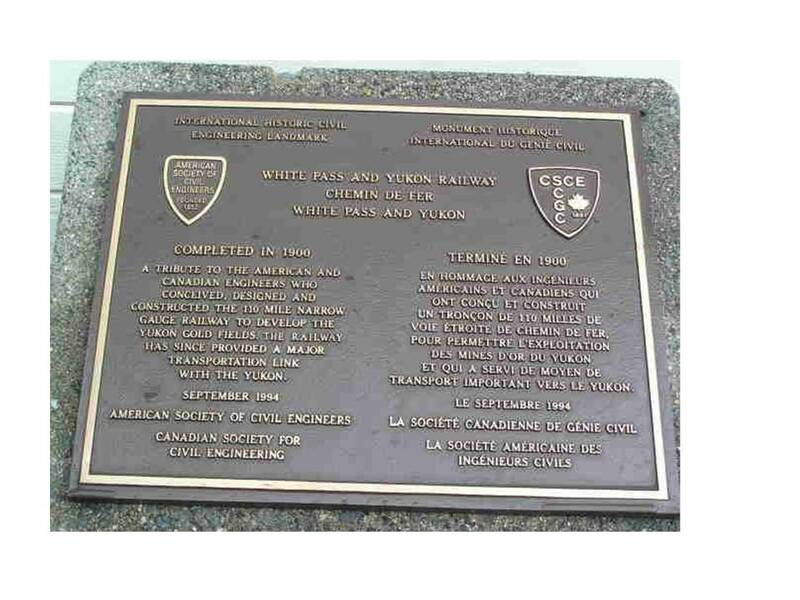 Containers were used to transport ore: they were loaded at the mines and shipped to smelters via rail and sea. Sea transport was by the world’s first container ship the Clifford J. Rogers.